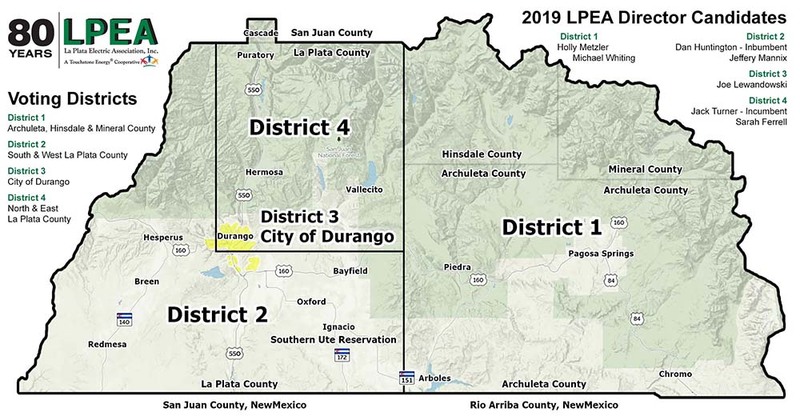 La Plata Electric Association, Inc. (LPEA), a Touchstone Energy Cooperative, is Colorado’s fifth largest electric distribution cooperative, serving more than 33,000 members in La Plata and Archuleta, with segments of Hinsdale, Mineral and San Juan counties. Each year, LPEA’s membership elects four representatives to the LPEA Board of Directors. Cooperative members vote for a single representative in the District in which they live. Businesses who purchase electricity from LPEA also have a vote in their districts. One member, one vote. Which District do you live in? LPEA members can use the following link https://www.arcgis.com/apps/webappviewer/index.html?id=2c783889173d419cbfa67b3c81237098 to access an interactive LPEA Voting District Map. Members can enter their street address in the address search box, located in the upper right corner of the browser, and the application’s map image will increase display your addresses location. Using your mouse, move the pointer over the image of your home or business and simply left to verify your address location. A pop up will display your LPEA Voting District.